I expected to learn how to take vital signs like blood pressure and temperature. What I did not anticipate was learning the multiple steps required to make a bed in a way that reduces the risk of developing bed sores or how to safely transport an elderly patient from a wheelchair to bed. Nor was I prepared to hear how diseases like dementia or Alzheimer’s can diminish a loved one’s mental capacity while others render them to a state where they are unable to perform basis daily functions like bathing, eating and toileting. I suddenly reconsidered my vow never to send my mother to a long-term care facility and asked myself “Am I really prepared to care for my mother and all that comes with it when the time comes?” Maybe not now, but the information and skills that I am learning in the nursing assistant class will ensure that I am. If you have doubts about whether you are prepared or capable of caring for your parents or other elderly family members, you can start preparing now by gathering information, learning the skills and finding out what resources are available to ensure that you are well prepared. Join us for a real-time discussion about questions raised by this essay on Wednesday, September 26 , 8:15 to 8:45 a.m. See Discussion and SL tabs above for details. Link to the virtual meeting room: http://tinyurl.com/cjfx9ag. Ehlman, K; Wilson, A; Dugger, R; Eggleston, Coudret & Mathis, S. (2012). Nursing Home Staff Members’ Attitudes and Knowledge about Urinary Incontinence: The Impact of Technology and Training. How to become a Nursing Aide, Orderly, or Attendant. Occupational Outlook Handbook. Retrieved from http://www.bls.gov/ooh/healthcare/nursing-assistants.htm#tab-4 on September 20, 2012. 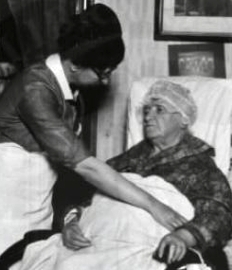 Image source: National Library of Medicine: History of Medicine: National League for Nursing Archives, 1894-1952. See picture on ETGEC Facebook page of Rodger doing his “Los Lonely Boys” impersonation.